South Mountain Window Cleaning, LLC is the top-rated window cleaning service in Phoenix, Arizona. We offer full service commercial and residential window cleaning to our clients valley-wide. With over 300 five-star Google reviews, it is apparent that our clients are pleased with our service. We are a proud vendor for Amazon and Google Home Services. Our window cleaning technicians are all clean-cut, polite, and well trained. We seek out and hire only the best. Whether you have a 1-bedroom condo or a 100,000 square foot commercial property, you can rely on South Mountain Window Cleaning, LLC to restore your property’s curb appeal. Reach out to us today to get a fast and free quote for any of your cleaning needs. What can’t these guys do? I saw a post yesterday of the monsoon and they stated job security. lol I laughed. I show up to work this morning and my temp banner was almost blown away last night. So I was like hmmm who to call. They answered at 7am and was here by 8:15 and competed by 8:25am this morning. I love small biz. True hard working individual who care about the customer experience. Oh and I set up bi weekly window cleanings with them. Killed 2 birds one stone. I am very happy with South Mountain Window Cleaning and the great job they did cleaning the windows at our home! We had the inside and outside along with our screens cleaned today. The communication from the initial estimate to the cleaning day was outstanding! They showed up on time and it was just an overall great experience. We will use them again and I highly recommend them to anyone who wants clean windows in their home or business. I just hired South Mountain Window Cleaning again to clean windows and stucco on our new house. They went way out of their way to drive to the edge of QC and San Tan Valley and did not charge me extra! They did another amazing job. Since they had a little more time than they had originally planned for, they heat washed my driveway for free. My husband cannot stop bragging about the oil stains being removed ! Super impressive work as always! Thank you very much! Our residential window cleaning services are second to none. From the first phone call to the final walk around our goal is to provide you with a customer service experience like no other. Our 100% satisfaction guarantee means that you have nothing to worry about during your service. Our residential window cleaning services include: inside and out window cleaning, screen cleaning, screen repair, track cleaning, window tinting, ceiling fan cleaning, coach light cleaning, mirror cleaning, and more. Our commercial window cleaning service is the most reliable in Phoenix, Arizona. Computerized scheduling assures that we show up when we are supposed to. We offer weekly, monthly, and quarterly maintenance window cleaning as well as one-time services. Our technicians are trained to be polite and courteous to your clientele, opening doors and staying out of the way. Our goal is to be in and out without you ever realizing that we are there. We carry a $2 Million Insurance Policy to protect both our business and yours. South Mountain Window Cleaning, LLC also offers full service power washing. We power wash drive-thrus, dumpster pads, walkways, building exteriors, and more. Power washing is a necessary service to keep your property not only clean, but safe. Built up grease and grime can cause slip hazards to your clients and employees. We will safely remove these hazards while restoring your properties cleanliness. The easiest solution for rejuvenating any property back to its former beauty is through power washing. Solar panels in Arizona can soak up more rays than just about any other place in the country. This can provide you great returns on your investment through solar energy. However being in Arizona there is a lot of dust and very little rainfall. This causes a two-fold problem. Due to these issues your solar panels will be overtaken by dirt, not allowing the solar cells to efficiently harness the power of the sun. Our solar panel cleaning service will have your panels perfectly clean and performing at their maximum ability! We promise to provide to you the best cleaning experience you've ever had. There's a reason we're the #1 cleaning company in AZ and we'd love to show you why! A professional Window Cleaning service can make your home feel clean and inviting while allowing more natural light to fill your home. Our house washing service is a must have to keep your home looking great and if you're selling your home it will provide a great return on investment. Our Christmas light service is all inclusive. We handle the installation, maintenance, removal and provide custom cut, professional grade LED lighting. Our power washing services are safe and effective and a must have service to maintain a clean exterior of your home or commercial building. Rust removal services are affordable and will safely and effectively wash away all of the unsightly stains around your business area. Solar panel cleaning not only protects your investment in solar energy but also increases the efficiency in which your solar panels can perform. Our dumpster pad cleaning services will keep your commercial building clean and safe while keeping odors and unwanted pests away from your business. 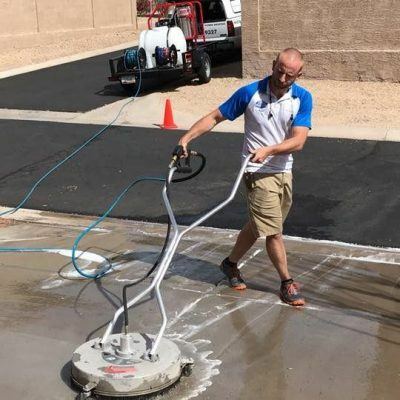 Our flat surface pressure washing services can clean your driveways, walkways, decks, parking lots and any flat surfaces that are dirty or stained.